Saix कुत्ते का बच्चा, पिल्ला. Coloring donw द्वारा the first, drawing done द्वारा the later.. HD Wallpaper and background images in the किंग्डम हार्ट्स club tagged: kingdom hearts kh kh2 saix puppy demyx cute comic strip funny. Kingdom Hearts Valentine's दिन cards. NEW Dual Wielding Roxas Play Arts Kai Figure! y is he called puppy anyway? saix:wtf are you talking about!? aww poor demyx he's all alone wif Zigbar, uh-oh wheres puppy whenyou need him??? ah well, it's kinda funny! Lol... Wheres Rapeist-be-gone when you need it? 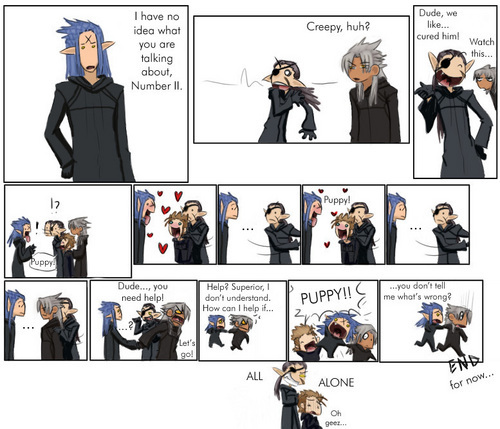 I love Saix...the puppy too.